If you follow me on Instagram you will know that i am pretty snap happy and love taking pictures and uploading them onto their using pretty filters! I have nearly 400 photos on there and knew that one day soon i wanted a pretty Iphone case for them as id seen a few girls review them on their blogs! Casetagram is a website where you can design phone cases for not just Iphones but other phones too, plus Ipads and Ipods. You can choose either a black or white outer case and different picture layouts. I chose the golden grid layout on a frosted white case for the Iphone 4S which could hold 24 pictures on! It costed $34.99 which translated to around £22 with free shipping which i definitely dont think was too bad at all! The best thing i think is that you can log into instagram and scroll through all your pictures on there but you can also upload from facebook and your computer if you wanted to, which is what i did for a couple of the pictures i wanted on which i dont have on Instagram! My case consists of pictures of me and my best friends, family and glasses of champagne. I love it so much! The only problem for me now is that even though i have had this for like 3 weeks, I have just recently got the Iphone 5! But i have already designed my Casetagram case for it as i seriously love them that much! You can find the Casetagram website here. What do you think? I possibly dont think i could ever want another case again! Unless i update them with current pictures. New Look is a store i shop in pretty frequently and recently they have been making me smile in the fashion department! This dress from AX Paris I think is simply stunning. It is so classy and elegant yet it is a teensy £40 which i think is such a bargain! I love the AX Paris brand, I think there is some gems to be had! This would be perfect for a prom or ball! 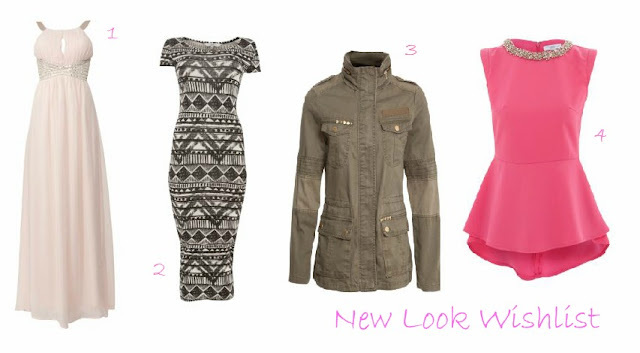 I think this Aztec Midi Dress is bang on trend for right now! It is stunning but unfortunately really dont think it would suit my figure which is such a shame! Its the right length so you wouldnt have to wear anything underneath such as tights/leggings and i think it would look amazing with a leather jacket thrown over the top! Oh and did i mention its only £14.99?! I have wanted this khaki studded jacket from New Look forever! My best friend Carla has it and as much as i have tried to nab it from her it just isnt happening! I think the only think that has put me off purchasing so far is that i have a similar jacket from River Island with faux leather sleeves that i wear literally all the time! Probably time to take the plunge? I think so! I am in love with peplum tops! Peplum plus a jewelled neckline is always a winner in my book and i love the fuchsia shade of this! I have hugeeee hips (definitely not an exaggeration i promise!) so they are probably the top i should stay away from the most but i think they just look so effortlessly chic with a pair of skinny jeans! This one comes in at £24.99! Roll on pay day! Only 9 days to go!